Any study examining Sitka’s distinctiveness absolutely must include a fisherman – fishing has been a mainstay of civilization on Baranof Island, literally since the dawn of civilization. But not all fishermen are men. In part four of her five-part series of Sitka profiles, reporter Diana Saverin meets Linda Behnken, who is a fisherman, resource advocate, policy planner, and mom. Like many in Sitka, Linda Behnken finds herself more on her boat than on land during fishing season. She’s a fisherman, among other things. She came here for the first time when she was in college, and she fell in love on sight. Since then, she’s been committed to this town, and the lifestyle that it offers. Moving to Sitka to fish wasn’t always the plan though. She was thinking of being a writer while in college at Dartmouth. But Sitka offered something she couldn’t refuse. Linda stayed in college, eventually earning a Master’s from the Yale School of Forestry. From there, she moved into resource policy, where she’s been ever since. Linda has run ALFA, the Alaska Longline Fisherman’s Association for twenty years, and she served three terms on the North Pacific Fisheries Management Council. Linda seemed to pick the toughest battles: The Southeast trawl ban created one of the largest areas without trawlers at the time. And she also helped craft the IFQ management system for the bottom fisheries. This work didn’t always make her popular, but it did preserve a way of life for many fishermen. Fishing is grueling work; so is advocacy, even though it doesn’t leave evidence on her calloused hands. There’s always a new issue. Declining quota, bycatch, reconciling differences with the charter sector – even sperm whales, who’ve figured out that cod and halibut caught on longlines make a tasty treat. Linda thinks about a quieter life, but so far doesn’t have an exit strategy. And Linda has a third full time job: She’s the mother of two boys, Halen and Rio, who are seven and nine. As she works to preserve the lifestyle of small family fishermen on a larger scale, she’s adapting a lifestyle of her own to make her many jobs work in synergy. Diana Saverin is a Kinglsey Trust Fellow from Yale University. 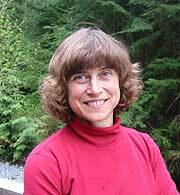 She visited Sitka last summer to interview residents who had participated in a study of the community’s distinctiveness. The study, by researcher Gary Holthaus, is called “Up for Discussion: What makes a Sustainable Community?” It was published by the Island Institute with support from the Alaska Humanities Forum.